How to completely restore Acer laptop Windows operating system to factory default settings? Use Acer eRecovery Management software or AOMEI OneKey Recovery application. Acer eRecovery Management is an application released by the company to do operating system backup and system restore. Step1. Type “acer recovery” in the search box and click “Acer Recovery Management” to open Acer Recovery Management. 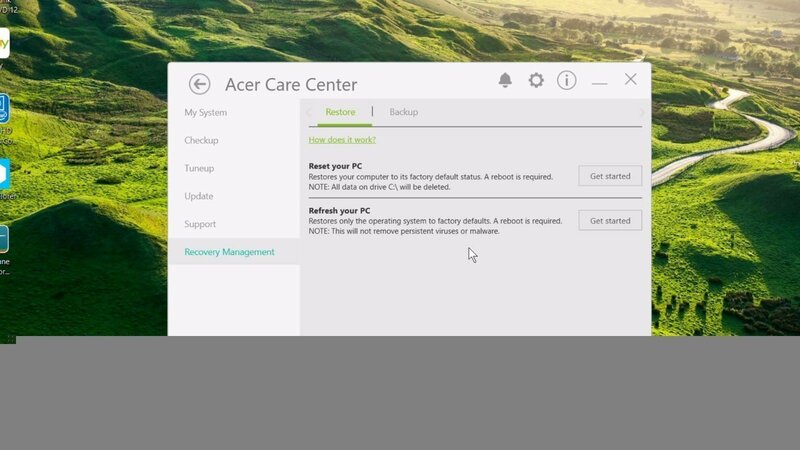 Or, just follow “Start” > “All Apps” > “Acer” folder > “Acer Recovery Management” to access Acer Recovery Management in Acer Care Center. 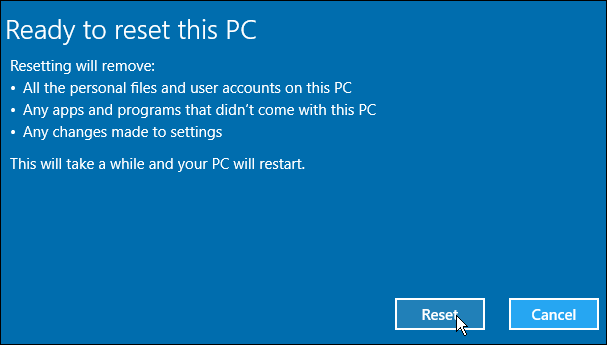 Step2.Click “Get started” to the right of Reset your PC. 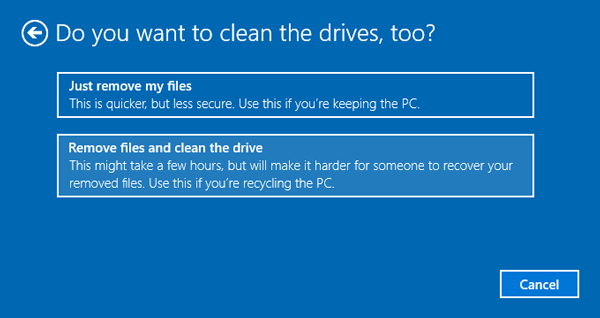 Step4.Click “Just remove my files”. Step5. Confirm and click “Reset”. It will take about 20 minutes depends on your mode to finish the restoration. It will take another 20 minutes to prepare your pc and it will restart several times during the process. When it finishes, it will restart one last time and ask you to make some settings just as the first time you get your machine. AOMEI OneKey Recovery is a third party program developed by AOMEI Technology to achieve system backup and restore work for desktop, laptop, notebook, etc. Note: To do acer restore system to factory default settings with AOMEI OneKey Recovery, you should first make a recovery partition with it based on an operation system which is in good condition. Such os can be on another healthy computer. Step1. Launch AOMEI OneKey Recovery into its main window and choose “OneKey System Recovery”. Step2. Specify a way to restore your system. Restore from AOMEI OneKey Recovery Partition or image file in other location. Step3. Specify where to recover factory defaults to, original system partition or other place. 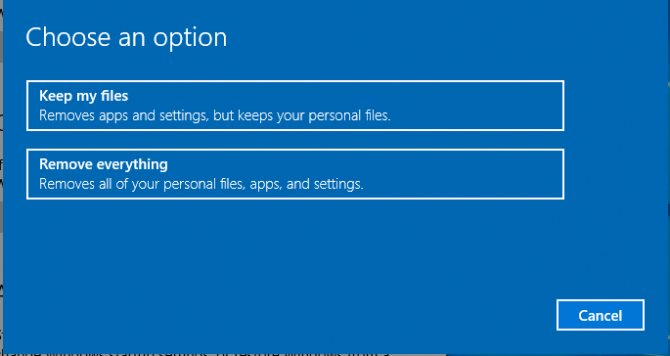 If you restore factory settings to other location, you will still boot into current system the next time you open your computer. To boot into factory default settings, you should set it as the first boot choice in boot order in BIOS. Thus, if you do not need current system anymore, just restore current operating system to factory defaults (keep default selection in this step, restore to current os partition). Step4. Click “Start Restore” and wait until it finishes. When it finishes, the machine will restart several times and requires initial setups. Except for Acer computer, AOMEI OneKey Recovery can also be applied to Lenovo, HP, Sony, Toshiba, Samsung, Asus, etc.